This is an immaculately produced album, overseen by guitarist Rostam Batmangli. Each song is given the room to breathe and shine while still remaining tight and focused, as though the band is tunefully playing away on the harpsichord in the middle of an empty concert hall. This is seemingly in opposition to lead singer Ezra Koenig’s elastic voice which is so tight that it feels like all the breath has been sucked out of it. 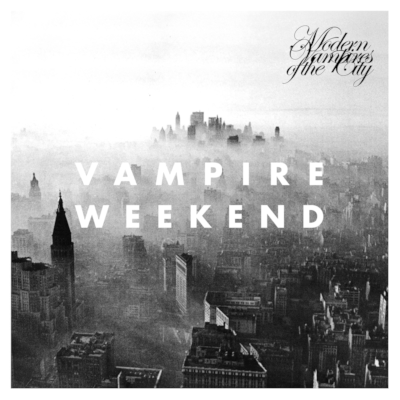 Like previous Vampire Weekend offerings, Modern Vampires of the City is very much an album’s album, but this one nailed the perfect mix of silly and sincere. Sure there are standout tracks, and high energy singles like Diane Young that are more immediate than others, but these faster paced songs only work because of their relation to the mid tempo pieces like gorgeous opener Obvious Bicycle and the superlative and tender romantic travelogue Hanna Hunt. In fact, unlike their first two albums, where the opposite was true, the fast paced singles are generally less successful than the album’s slower moments. The faster single-ready tracks like Diane Young and Finger Back are appropriately dizzying and add a much needed sense of fun that stop that album from turning maudlin and self-serious. However they are also somewhat overworked, with too much going on to properly appreciate Koenig’s vocal performance and he and Batmangli’s lyrics. The production is more successful on the songs where it tries less to create chaos and tries more to subtly elevate and invigorate Koenig’s increasingly delicate voice like on the intricately modulated singles Step and Ya Hey, both of which stand out in an album full of great tracks. However tracks like Don’t Lie and Unbelievers find a nice middle ground between insistently sung mid-tempo tracks, with careful but simple lyrics and the maximilism of faux-orchestral harpsichord-heavy fills that make half the album sound like a late 1960s rainy day english folk recording. But you know what, that’s fine by me. Hudson, the last real track of the album (not including the pretty coda, Young Lions) doesn’t fair so well. It comes too late in the album, and is far too melodically and vocally listless to have any real impact on the listener. The album would be tighter without its inclusion, but it is a minor sore spot in an all together fantastic record. Favourite Tracks: Obvious Bicycle, Unbelievers, Hanna Hunt. Grade out of 10: 8.5 increasingly moody album covers. This entry was posted in Music, Vampire Weekend and tagged 3rd album, Ezra Koenig, Modern Vampires of the City, Rostam Batmangli by Nicholas Hayes. Bookmark the permalink.